Nursing school isn’t easy. If it was, everyone would do it. Between going to class, writing endless care plans, and getting ready for the NCLEX®, nursing students keep busy! It helps to have Picmonic on your side. Picmonic for Nursing is the ultimate get-ahead (while having fun!) visual mnemonics study guide. Studying with Picmonic provides you with all the essentials you need to pass the NCLEX and then actually remember that information when you start working the floor. But Picmonic isn’t the only thing that can help you through nursing school. We have seven tips that might make nursing school easier. Staying organized is a major part of life, so it’s no surprise that staying organized in nursing school is important. It’s number one on our list for a reason: keeping track of assignments, notes, and schedules will help you become a better nurse and, well, maybe even a better human. Practicing your organization skills in the short-term fuels time management and helps you create a study schedule while preparing you for managing patients and their paperwork in the future. Staying organized also makes studying way easier. Kind of like Picmonic. Picmonic is great because no matter where you are in your studies, there’s a mnemonics Pathway for that. Plus, our Pathways can be used as “visual study guides” and help you retain way more than just re-reading your lecture notes. We’re also a huge fan of keeping everything “in the cloud” if you can, so we recommend studying with ebooks like the Pocket Guide series and apps like the NCSBN Flashcard App or even Picmonic, which is available on iOS and Android. Are you having a tough time in class? Falling behind? If there’s a concept you don’t understand, don’t wait until the night before a test to try to learn it. Get help immediately. Raise your hand in class, ask a friend or professor, or get together a study group to ensure that you can grasp all the lessons. Nursing school class material often builds upon concepts, so if you wait to get help you may already be too far behind to catch up. Ask questions early and often! On the first day of class, get the phone number of two designated “study buddies.” Use your newfound friends to share notes, study guides, and other source material like Picmonic playlists and highlights from your Pocket Guide. With Picmonic, you can also easily share playlists with classmates (and they can share with you!) so have everything you need to learn for your next exam. It’s important to have people who can fill in the blanks if you miss a lecture or to help answer a question if you’re having some trouble. Plus it’s also easier to study with friends, so friend your way to an A. The NCLEX is hard. Don’t wait to study. Creating a study schedule (and sticking to it!) before test-crunch time will help you with that whole work/life balance thing Gwyneth Paltrow is always talking about. Nobody likes to be stuck in a corner studying instead of hanging with friends, but studying a little every day with Picmonic’s visual aids, for example, (instead of one full weekend of cramming) and putting the work in early means you won’t be as stressed later. No need to even crack open a textbook. Use your smartphone to casually read a bit of your Nurse’s Pocket Guide, check in with Picmonic on your mobile device, or explore the Human Anatomy Atlas app all while in line for your morning coffee. Then, be sure to test your new knowledge with Picmonic’s Daily Quiz to help increase retention and ensure you’re exercising that mind muscle on the reg. Apps are the easiest way to study on-the-go. We happen to think Picmonic’s mobile apps for both iOS and Android are easy (and fun!) to use (and boost your test scores up to 50%) but, there are also apps such as the Nursing Central App, the Netter Anatomy App or the Human Anatomy Atlas app that are available for download on your smartphone or tablet. Plus, using these apps with ebooks such as The Nurse’s Pocket Guide and programs like Quizlet can be super useful when it comes to helping you stay on schedule and ace the NCLEX. But, you don’t have to scour the web. 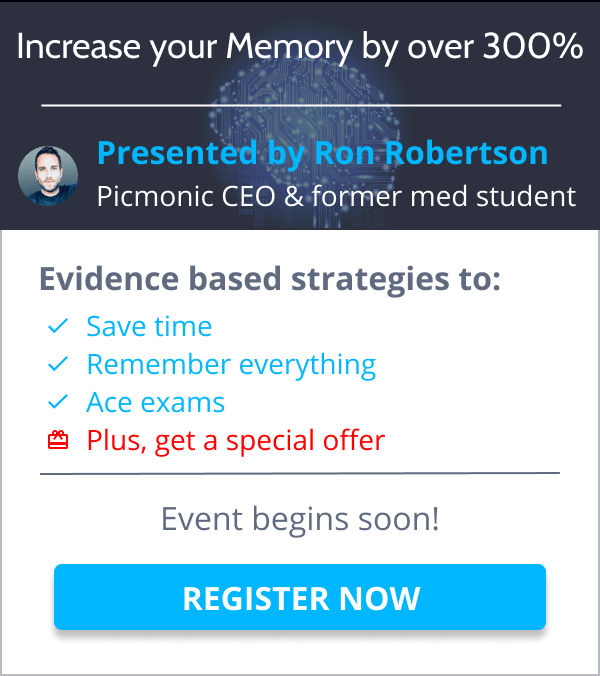 Picmonic has already written about some cool apps that can help you through nursing school. Coming to class without doing the reading or an assignment regularly can put you far behind. Being prepared can make lectures a lot easier to understand. Don’t have time to do the reading before class? At least read the key points for the chapter, create an outline in your notes, look over your NCSBN Flashcard App, and review Picmonics for the lesson in advance. That way, you have a general idea of what will be discussed. Sometimes you need to study, but sometimes you just need a break. Don’t beat yourself up for missing a night out with friends to study, but know when you should take a break and live a little. If you’re having trouble concentrating… and you’re on hour seven of studying for the NCLEX… consider taking a moment to get some fresh air and see a friendly face before you head back to the books or study app- even if Picmonic is super fun. These seven tips can help you have the best nursing school experience, but, it doesn’t have to stop there. Pick up Picmonic for Nursing to make studying enjoyable and far more interesting than any textbook! Try Picmonic for free today!